Don't Trust The "New Kurt Cobain Album"
On November 6, Brett Morgen, director of the recent Kurt Cobain documentary Montage of Heck, will aid in the release of a new Kurt Cobain album, to coincide with the DVD release of the film. For some fans, any new Cobain content, no matter how craven, is an exciting development. But let’s not pretend it’s anything more than that. We’re going to be putting out an amazing album this summer that I think will answer that question ... It will make you feel like you’re kind of hanging out with Kurt Cobain on a hot summer day in Olympia, Washington, as he fiddles about. It’s going to really surprise people. Just to be clear, it’s not a Nirvana album—it’s just Kurt, and you’re going to hear him do things you never expected of him. But a dozen or so random pieces of music plucked from years and years of home recordings does not an album make. Furthermore, I seriously doubt that Kurt Cobain would ever want anyone to feel like they were hanging out with him: If anything, he was trying to get away from people. My guess is that this album will make you feel like either you’ve broken into his home in an alternate universe or that you’re some kind of afterlife peeping tom, listening in on something you know you shouldn’t be hearing. Morgen has spent so much time documenting Cobain that he may feel like he really knows him. But he doesn’t, and neither do you. Montage of Heck was a hard watch, but it was well done, and in the moment it felt like a true-to-life depiction of what Cobain went through: It didn’t shy away from his struggles and reveled in plenty of sordid details, but the result was intimate without quite seeming exploitative. But stuff like this makes me reconsider. 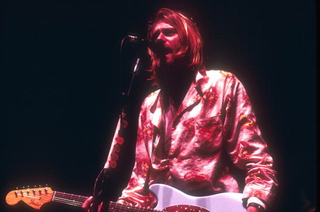 Last week a home-movie clip surfaced of Kurt lying next to a bucket of vomit, struggling with crippling stomach pain and making jokes about needles. Courtney Love was the one filming; the result had the same queasy, voyeuristic feel as some of Montage’s most uncomfortable moments. But without the context of the full film, it felt like an intrusion. This is what passes for a DVD extra now? This record is out in November, so gear up for another three months of this kind of thing. No one can speak for the dead, but that won’t stop people from trying. Especially if the dead sell records.